Named after the famous Lake Winnipesaukee. This blend isn’t just for the weekend. It has a very unique flavor medium body and lasting finish. THIS IS AWESOME COFFEE! WE HAVE GONE THROUGH 5 14OZ BAGS...EVERY BATCH WAS TERRIFIC. HIGHLY RECOMMENDED, SUPER FAST SHIPPING. THANK YOU. I have tried several coffess from Wood Shed Roast and this, like all the others, does not disappoint. It is a smooth clean blend and I intend on purchasing more. I agree with another reviewer who stated "get a good burr grinder and a decent coffee pot...put Starbucks out of business"! Absolutely! 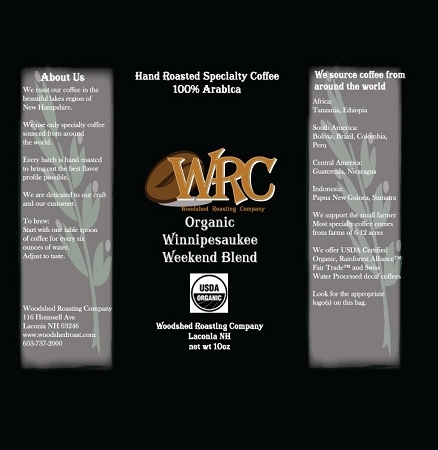 My hubs and I found WRC Winnipesaukee Blend at Ciffeeberries in Londonderry, my husband loved the aroma so we bought a pound of beans. I made a pitcher of iced coffee with it and urged my hubby to try it, even though he never used to drink coffee. Now I make a pot every day and we are both loving it. We usually try to always buy local so this is perfect!! I bought this as a gift for my two brothers, who are coffee afficionados. They declare it's the yummiest coffee they've ever had. Great coffee. Just the right body, and the aroma is fantastic. We buy it in 10lb batches now. Get yourself some beans, a good burr grinder, a decent coffee pot, and help put Starbucks out of business.